Since I can’t start working on the yurt until the wool gets cleaned, blended, and put into batts I’ve been looking at lots of photos and talking to everyone about the project. The following are two that show yurts in different locations that I thought were pretty inspirational. 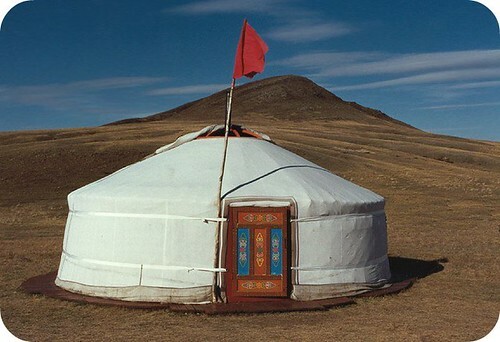 This is a yurt in its traditional location, Mongolia, in the desert. It looks like this one has a cover over its felt layer, which is probably smart to keep it clean and cover possible air drafts from the overlapping pieces of felt. I’ve talked to many people about potentially coating the yurt I’m making in everything from polyester resin to electro-luminescent wire to paintings so this gives me some ideas to mull over too. The above image would be my dream on a beach with no humidity, where it gets cool at night and a felt yurt wouldn’t be too hot! 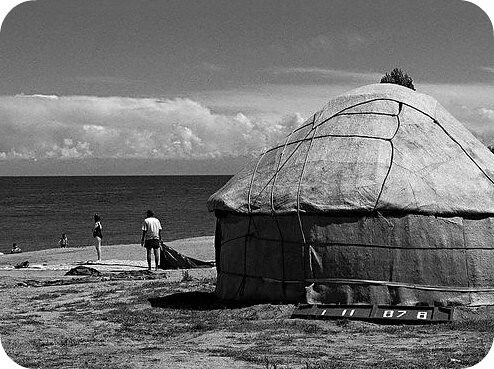 In talking to someone new about the project today she sent me the link to information on her family’s yurts, that they live in on their property in the Hamptons in the summer — check it out on Apartment Therapy. More to come! This entry was posted on Friday, September 18th, 2009 at 1:23 am and is filed under Yurt. You can feed this entry. You can leave a response, or trackback from your own site. We recently had a visiting American dinner guest who lives in a yurt. She loves it. She has three yurts, and she’s named them all: Gurt, Burt, and Yurt.